Venezuelan President Nicolás Maduro accused US Vice President Mike Pence of ordering a coup against him after the official declared his support for Wednesday's anti-socialist opposition marches. 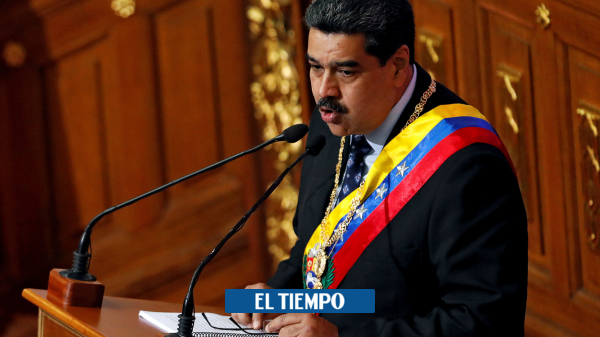 "What the US government did through Vice President Mike Pence, to give the order to execute a fascist coup (…), has no precedent in the history of relations between the US and Venezuela in 200 years, "he said Tuesday during a radio and a television station. The president ordered his chancellor, Jorge Arreaza, to initiate "a total revision of relations" with the United States to take decisions in the coming hours of "political and diplomatic character" in defense of Venezuela. Maduro has already ordered this measure in July 2017, when Washington threatened to impose economic sanctions on the oil country. Previously, the Minister of Communication of Venezuela, Jorge Rodríguez, accused Pence of having ordered "terrorists" to promote acts of violence in demonstrations opponents to destabilize the government. Mike Pence, vice president of EE. UU. According to Rodriguez, some of the 27 soldiers arrested on Monday after the uprising against Maduro confessed giving opposition activists part of the stolen weapons "in such a way that for acts of violence, injuries and deaths they were perpetrated in the demonstration. " The minister said that these people are part of the People's Will party, which he called a "terrorist cell". In that formation militant the leader Leopoldo Lopez, under house arrest, and the president of the majority parliament, Juan Guaidó, ready to lead a "transitional government" to replace that of Maduro. According to Rodríguez, the plan would consist in the fact that people dressed in military uniform "would eventually disappear tomorrow at the opposition demonstration". "For what? To meet the orders of Mike Pence," he said, pointing to the vice president, who in a video on Tuesday expressed his support for demonstrations that will require a transitional government and free elections. The government has also invited supporters to march on Wednesday. The brief rise of Monday has warmed the spirits in the face of the mobilisations, the first major impulse in the streets after the violent protests that left about 125 dead between April and July 2017. The United States, as well as the European Union and most of the Latin American countries, are not aware of Maduro's second mandate, started on January 10th. Caracas and Washington, with the tense relations of the late former president Hugo Chávez (1999-2013) have taken power, the ambassadors have been missing since 2010.